German-American chief designer, leader of the 'Rocket Team'; developed the V-2, Redstone, Jupiter, and the Saturn rockets that took US to the moon. He made the idea of space travel popular in the 1950's and a reality in the 1960's. Born: 1912-03-23. Died: 1977-06-16. Birth Place: Wiersitz. Wernher von Braun was the leader of what has been called the "rocket team," which had developed the German V-2 ballistic missile in World War II. Attended institutes of technology in Berlin and Zurich and received doctorate in physics at the University of Berlin in 1934. Joined the rocket experimental center in Peenemunde in 1937 and was director of research until 1945; his work and that of his colleagues led to development of the V-1 and V-2 guided missiles used against the Allies during World War II. Surrendered to U.S. Army in 1945. Von Braun and some of his chief assistants--as part of a military operation called Project Paperclip--came to America and were installed at Fort Bliss in El Paso, Texas, to work on rocket development and use the V-2 for high altitude research. They used launch facilities at the nearby White Sands Proving Ground in New Mexico. Later, in 1950 von Braun's team moved to the Redstone Arsenal near Huntsville, Alabama, to concentrate on the development of a new missile for the Army. They built the Army's Jupiter ballistic missile, and before that the Redstone, used by NASA to launch the first Mercury capsules. After being moved to NASA, von Braun led his rocket team in the development - within only six years - of the monster Saturn I and Saturn V boosters, that took America to the moon. Von Braun's long standing dream of moving on to his personal life objective - Mars - was crushed by the Nixon administration and a public grown jaded and indifferent to spaceflight. Von Braun died at Alexandria, Virginia just five years after leaving NASA after being sidelined into a headquarters job. Country: Germany, USA. Spacecraft: Von Braun Rocketplane, A-9, Von Braun Station, Von Braun Mars Expedition - 1952, Von Braun Cargo Ship, Von Braun Passenger Ship, Von Braun Lunar Lander, Von Braun Landing Boat, Von Braun Mars Expedition - 1956, 1956 Von Braun Passenger Ship, 1956 Von Braun Cargo Ship, 1956 Von Braun Landing Boat, Adam, Horizon Lunar Outpost, Horizon Station, Horizon Space Suit, Horizon LERV, Saturn II Stage Wet Workshop, Von Braun Mars Expedition - 1969. Launch Vehicles: A1, A2, A3, A5, A9/A10, A7, A8, A9/A10/A11/A12, A9/A10/A11, A6, A-4, A-4b, Von Braun 1948, Von Braun 1952, Von Braun 1956, Redstone, Jupiter C, Jupiter IRBM, Jupiter A, Jupiter C Juno I, Super-Jupiter, Juno V-A, Juno II, Juno II (3), Juno V-B, Redstone MRLV, Saturn A-1, Saturn C-2, Jupiter Mercury, Saturn B-1, Saturn A-2, Saturn C-4, Saturn I RIFT, Saturn C-3, Saturn C-1, Saturn C-5, Saturn C-3B, Saturn C-4B, Saturn C-3BN, Saturn C-5N, Saturn I Blk2, Saturn C-8, Saturn I, Saturn IB, Saturn V 2, Saturn MLV-V-4(S), Saturn MLV-V-1, Saturn MLV-V-2, Saturn MLV-V-3, Saturn INT-05, Saturn INT-27, Saturn IB-A, Saturn INT-05A, Saturn MLV-V-1A, Saturn MLV-V-4(S)-A, Saturn IB-B, Saturn IB-C, Saturn IB-CE, Saturn IB-D, Saturn MLV-V-1/J-2T/200K, Saturn MLV-V-1/J-2T/250K, Uprated Saturn I, SPARTA, Saturn INT-11, Saturn INT-12, Saturn INT-13, Saturn INT-14, Saturn INT-15, Saturn INT-16, Saturn INT-17, Saturn INT-18, Saturn INT-19, Saturn V-ELV, Saturn V, Saturn V-23(L), Saturn V-24(L), Saturn INT-20, Saturn LCB-Alumizine-140, Saturn LCB-Alumizine-250, Saturn LCB-Storable-140, Saturn LCB-Storable-250, Saturn V/4-260, Saturn INT-21, Saturn LCB-Lox/RP-1, Saturn MLV-V-4(S)-B, Saturn S-IC-TLB, Saturn V-25(S)B, Saturn V-3B, Saturn LCB-SR, Saturn V-4X(U), Saturn V-A, Saturn V-B, Saturn V-C, Saturn V-D, Saturn V-Centaur, Saturn V-25(S)U, Detko ATV. Projects: Explorer. Bibliography: 6163. 1912 March 23 - . Birth of Wernher von Braun - . Nation: Germany, USA. Related Persons: von Braun. German-American chief designer, leader of the 'Rocket Team'; developed the V-2, Redstone, Jupiter, and the Saturn rockets that took US to the moon. He made the idea of space travel popular in the 1950's and a reality in the 1960's..
Wernher von Braun born in in Wirsitz, Posen. - . Nation: Germany. Related Persons: von Braun. Von Braun was the second of three sons born to Baron Magnus von Braun and Baroness Emmy von Quistorp..
1923 December 15 - . Launch Vehicle: V-2. Die Rakete zu den Planetenräume published. - . Nation: Germany. Related Persons: Oberth, von Braun. Die Rakete zu den Planetenräume (The Rocket Into Interpanetary Space) by Hermann Oberth was published in Germany, and was the genesis for considerable discussion of rocket propulsion. The book would have a huge and life-changing impact on ten year old Wernher Von Braun. 1930 July 23 - . LV Family: V-2. Launch Vehicle: Mirak. VfR demonstrates rocket motor to German government officials - . Nation: Germany. Related Persons: Ley, Nebel, Oberth, Riedel, Klaus, von Braun. The VfR fires its 'Kegelduese' liquid oxygen and gasoline-fueled rocket motor in a demonstration for the Director of the Chemisch-Technische Reichsanstalt in an attempt to secure financial support. Nebel had arranged the demonstration and runs the Kegelduese for 90 seconds. It generates 7 kgf and consumes 6 kg of liquid oxygen and 1 kg of gasoline in that time (specific impulse 90 seconds). Participating are Oberth, Nebel, Riedel, Ley, and Von Braun. Nebel's Mirak is not yet ready to test. October 1932 - . Launch Site: Kummersdorf. Launch Complex: Kummersdorf. Launch Vehicle: V-2. Von Braun joins German Army missile program. - . Nation: Germany. Related Persons: von Braun. Wernher von Braun joined the German Army Ordnance Office rocket program at Kummersdorf. He is working on a 300 kgf thrust liquid propellant engine, which has been tested with an exhaust velocity of 1700 m/s, but it is believed can be tuned up to as much as 1900 m/s. This is to power the A1 rocket, which is to have the same tractor configuration as the 20 kg test rocket launched in August 1932. The main issue is how to solve the problem of keeping the rocket stabilised in flight, as the August test demonstrated. The A1 is to be 1.4 m long x 30 cm in diameter, a 150 kg gross takeoff weight, and 40 kg of propellant., allowing a 16.5 second burn time. 1934 July 27 - . Von Braun receives doctorate. - . Nation: Germany. Related Persons: von Braun. His public doctoral thesis, "About Combustion Tests," was completed in very little time (one source states that he joined the SS at this time). The actual thesis was later revealed to be a classified Army document. This dissertation, "Construction, Theoretical, and Experimental Solution to the Problem of the Liquid Propellant Rocket", was dated 16 April 1934 but did not surface until 70 years later. It detailed the construction and design of the A2 rocket that would fly later that year. 1934 December 19 - . 11:15 GMT - . Launch Site: Borkum. LV Family: V-2. Launch Vehicle: A2. A2 rocket 'Max' successfully launched. - . Nation: Germany. Related Persons: von Braun. Apogee: 2.20 km (1.37 mi). Von Braun's German Ordnance group launches A-2 'Max' from the Island of Borkum in the North Sea before the Commander-in-Chief of the German Army. The rocket is at an altitude of 1.7 km at burn-out, and reaches 2.2 km before falling back to impact 800 m from the launch point. 1934 December 20 - . 06:52 GMT - . Launch Site: Borkum. LV Family: V-2. Launch Vehicle: A2. A2 rocket 'Moritz' successfully launched. - . Nation: Germany. Related Persons: von Braun. Apogee: 3.50 km (2.10 mi). Von Braun's German Ordnance group launches the second of two A-2 rockets ('Moritz') successfully to a height of 3.5 km on the Island of Borkum in the North Sea. Burnout is at 1.8 km, and the rocket ascends more vertically than the test the previous day, reaching a greater altitude and impacting 500 m from the launch point. February 1936 - . LV Family: V-2. Launch Vehicle: A3. A3 rocket tested. - . Nation: Germany. Related Persons: von Braun. Germans tested A-3 rocket with 1,500 kgf thrust which served as basis for military weapon specifications..
1936 May 1 - . Von Braun enters Luftwaffe. - . Nation: Germany. Related Persons: von Braun. Wernher Von Braun joins the German Air Force and receives pilot training at Frankfurt/Oder and Stolp..
1937 May 1 - . Von Braun joins Nazi Party. - . Nation: Germany. Related Persons: von Braun. Wernher Von Braun joins the Nazi Party..
May 1937 - . Launch Site: Peenemuende. Launch Complex: Peenemuende. Launch Vehicle: V-2. Peenemünde opened. - . Nation: Germany. Related Persons: Dornberger, Thiel, Walter, von Braun. Joint German Army-Air Force rocket research station opened at Peenemünde on the Baltic Sea. The Army Ordnance rocket program under Capt. Walter Dornberger moved 90 of its staff from Kummersdorf. Thiel and five staff working on V-2 rocket engine development remained at Kummersdorf until the summer of 1940, when the test stands at Peenemuende were finally completed..
1937 December 4 - . Launch Site: Peenemuende. Launch Complex: Peenemuende GWO. LV Family: V-2. Launch Vehicle: A3. FAILURE: Engine cutoff at 6.5 seconds.. Failed Stage: 1. First A3 launch - . Nation: Germany. Related Persons: von Braun. Apogee: 0.10 km (0.06 mi). Range: 0.30 km (0.19 mi). First launch of an A3 rocket. New facilites being built at Peenemuende were not ready, so the A3 launches were made from the offshore island of Greifswalder Oie. The A3 launched on this day was 6.5 m long and 70 cm in diameter. The engine occupied the first 2 m of the fuselage. The missile had a 750 kg lift-off mass, including 450 kg of propellant, which was pressurised to 20 atmospheres. The 1.5 tonne thrust engine had a 1900 m/s exhaust velocity and a 45 second burn time. The parachute deployed 3 seconds after launch, and the engine cutoff at 6.5 seconds. The rocket impacted and exploded 300 m from the launch point. 1937 December 6 - . Launch Site: Peenemuende. Launch Complex: Peenemuende GWO. LV Family: V-2. Launch Vehicle: A3. FAILURE: Engine cutoff early.. Failed Stage: 1. A3 launch - . Nation: Germany. Related Persons: von Braun. Apogee: 0.10 km (0.06 mi). Range: 0.30 km (0.19 mi). Second launch of an A3. Same result as the first - the rocket made a quarter turn after launch, then reached only 100 m before the parachute jettisoned and the missile crashed into the sea a short distance from the launch stand..
1937 December 8 - . Launch Site: Peenemuende. Launch Complex: Peenemuende GWO. LV Family: V-2. Launch Vehicle: A3. FAILURE: Engine cutoff early.. Failed Stage: 1. A3 launch - . Nation: Germany. Related Persons: von Braun. Apogee: 0.10 km (0.06 mi). Range: 0.30 km (0.19 mi). Third launch of an A3. No parachute deployment and the engine cut-off early. The rocket impacted into the Baltic Sea and sank..
1937 December 11 - . Launch Site: Peenemuende. Launch Complex: Peenemuende GWO. LV Family: V-2. Launch Vehicle: A3. FAILURE: Engine cutoff early.. Failed Stage: 1. A3 launch - . Nation: Germany. Related Persons: von Braun. Apogee: 1.00 km (0.60 mi). Final launch of the A3. The rocket is fired without the parachute that ruined the first two attempts, but in heavy fog. It is more successful than earlier shots, but at 800 to 1000 m altitude it also veers over and thrusts its way downward into the ocean. Analysis showed that the fins steering the rocket could not overcome the 8 m/s wind blowing at the time of the launch. Further study shows that at the low speed of initial rocket acceleration, a wind as little as 4 m/s would be enough to topple the rocket. A rudder area ten times greater than is needed to control the rocket at low speeds. This result leads to the decision to abandon the A3 configuration and build the A5 to support development of the A4 missile. 1938 June 15 - . Von Braun is discharged from the Luftwaffe. - . Nation: Germany. Related Persons: von Braun. October 1939 - . Launch Site: Peenemuende. Launch Complex: Peenemuende GWO. LV Family: V-2. Launch Vehicle: A5. Failed Stage: 1. A-5 development rockets with gyroscopic controls and parachutes - . Nation: Germany. Related Persons: von Braun. Apogee: 7.00 km (4.30 mi). New test series at Greifswalder Oie. The island had changed a lot, with massive new concrete installations. Three A3's were flown with a new Siemens control system. The first was launched vertically, reaching 7 km at 45 seconds into the flight at the time of engine cut-off. Both the drogue and main parachutes functioned correctly, and the rocket splashed down in the harbour and was recovered a half hour later by a motor boat (the rocket could float for up to two hours before water entering the empty propellant tanks would sink it). Von Braun learns of Saenger's secret work at Trauen - . Nation: Germany. Related Persons: Hermann, Rudolf, Saenger, Thiel, Walter, von Braun. Saenger's advanced rocketry work was so secret that Von Braun was not even aware of it until one of his team, looking for a new method of rocket ignition, heard of its existence. Von Braun, Walter Thiel, and Rudolf Hermann were finally given a tour of Saenger's advanced facilities at Trauen. 1940 May 1 - . Von Braun promoted to SS Untersturmfuehrer. - . Nation: Germany. Related Persons: von Braun. Von Braun's membership in the SS is 'renewed' and he is promoted to Untersturmfuehrer with the SS number 185068. 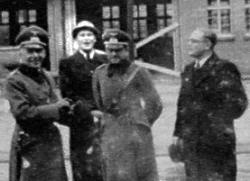 According to some accounts he had joined the SS as early as 1934..
Saenger attends hypersonics conference at Peenemuende. - . Nation: Germany. Related Persons: Saenger, von Braun. Reciprocating his visit to Saenger's Trauen facility earlier in the year, Von Braun obtains permission for Saenger to attend a hypersonics symposium at Peenemuende..
1941 November 9 - . Von Braun promoted to SS Obersturmfuehrer. - . Nation: Germany. Related Persons: von Braun. 1942 November 9 - . Von Braun promoted to SS Hauptsturmfuehrer. - . Nation: Germany. Related Persons: von Braun. 1943 April 15 - . Launch Vehicle: V-2. V-2 development detected by British Intelligence. - . Nation: Germany. Related Persons: von Braun. Prime Minister Winston Churchill of England was informed of reports on German experiments with long-range rockets..
1943 May 30 - . Launch Site: Heidelager. Launch Complex: Heidelager. Launch Vehicle: V-2. V-2 firing range to be established in Poland. - . Nation: Germany. Related Persons: von Braun. It is decided to move testing of production V-2s and training of combat launch crews from the Baltic Sea to the middle of Poland, at Heidelager, near Blizna. German units here operationally test fired over 100 V-2's, launching 10 on one day, only a small number of which were fully successful. 1943 June 28 - . Von Braun promoted to SS Sturmbannfuehrer. - . Nation: Germany. Related Persons: von Braun. He was assigned to the Staff of the Oberabschnitt Ostsee..
1943 July 7 - . Launch Vehicle: V-2. V-2 given top priority. - . Nation: Germany. Related Persons: Hitler, von Braun. Adolf Hitler gave the German V-2 program highest military priority..
1943 August 17 - . Launch Site: Peenemuende. Launch Complex: Peenemuende. Launch Vehicle: V-2. Peenemünde attacked by RAF. - . Nation: Germany. Related Persons: Reitsch, Thiel, Walter, von Braun. The Royal Air Force attacked Germany's Peenemünde Rocket Research Center, causing heavy damage and delaying V-weapon program by months. With the V-2 development program already in crisis, the Allies launch a massive bombing raid against Peenemuende. On that evening test pilot Hanna Reitsch was visiting the launch site. At 23:30 the air raid siren sounded. 600 British bombers drop 1500 tonnes of ordnance on the launch centre. However many bombs fell in the ocean around the peninsula, or buried themselves harmlessly in sand dunes. The resident area was hardest hit, while the Luftwaffe station at Peenemuende West was not touched. 47 British bombers were shot down - they were told before the raid that this was the most important mission of the war, and that their commanders would accept a 50% loss rate. 735 people were killed in the raid on the ground, including 178 of the 4000 inhabitants of the residential area. A large number of the foreign slave workers in the Trassenheide concentration camp barracks were also killed. After the tremendous raid the rocket team wander around the devastated facility, half-clothed, the buildings bathed in a weird light and everything covered in fine sand, as if flour was dropped over everything. Thiel and Walther - the two leading rocket engineers in Germany - were killed in the raid, and virtually all major facilities were damaged. The saving grace was that the soft sand of Peenemuende attenuated the blast of many bombs. Nine bombs hit the main assembly hall, but while there was splinter damage to some of the machine tools, there was no decisive hit that would prevent production from continuing. It was estimated that operations could resume in 4 to 6 weeks. The raid was not unexpected. The high altitude contrails of the V-2 test launches were called 'frozen lightning' and could be seen from Sweden on clear days. The location and purpose of Peenemuende appeared in a crossword puzzle in a illustrated magazine published in central Germany in early 1943. British reconnaissance flights to locate the launch facilities had been recognised for what they were. This raid, together with the bombing of V-2 production lines at the Zeppelinwerke in Friedrichshafen and the Raxwerke in Wiener Neustadt convinced Saur to reduce the V-2 production rate goal to 900 per month. 1945 - During the year - . LV Family: V-2. Launch Vehicle: A9/A10/A11, A9/A10/A11/A12. Von Braun documents plans for future uses of rocket power. - . Nation: Germany. Related Persons: von Braun. Spacecraft: Von Braun Station. As part of a summary of his work on rockets during World War II, Wernher von Braun speculated on future uses of rocket power. These included an observatory in space, the construction of space stations in earth orbit, a space mirror, and interplanetary travel, beginning with trips to the moon. Late February 1945 - . Launch Site: Peenemuende. Launch Complex: Peenemuende. Launch Vehicle: V-2. Final Von Braun visit to Peenemuende - . Nation: Germany. Related Persons: von Braun. All launch activity has been shut down..
1945 May 2 - . Launch Vehicle: V-2. Peenemuende rocket team contacts American forces - . Nation: Germany. Related Persons: von Braun. English-speaker Magnus Von Braun is sent to contact US forces in order to surrender the German rocket team to the Americans..
1945 May 5 - . Launch Site: Peenemuende. Launch Complex: Peenemuende. Launch Vehicle: V-2. Peenemünde occupied. - . Nation: Russia. Related Persons: von Braun. Russian ground forces occupied Peenemünde, Germany..
1945 May 27 - . Launch Vehicle: V-2. American recover 14 tonnes of V-2 documentation - . Nation: Germany. Related Persons: von Braun. The German rocket team provides directions to the Americans to the mine in the Harz Mountains where they have hidden the technical documentation taken from Peenemuende..
1945 June 20 - . Von Braun team to be brought to the US. - . Nation: USA. Related Persons: von Braun. U.S. Secretary of State Cordell Hull approved the transfer of von Braun's German rocket specialists to the United States. This transfer was known as Operation Paperclip..
1945 July 23 - . Launch Vehicle: V-2. German space plans revealed to US public. - . Nation: USA. Related Persons: von Braun. Life magazine published drawings of a manned space station as envisioned by the German rocket scientists of Peenemünde..
1945 September 1 - . Launch Vehicle: V-2. Von Braun in America - . Nation: Germany. Related Persons: von Braun. Von Braun and a small contingent fly to Fort Bliss, Texas. Over 100 Peenemuende rocket engineers will follow by sea..
1945 October 1 - . Launch Vehicle: V-2. Project Paperclip begun - . Nation: USA. Related Persons: von Braun. Secretary of War Patterson approved plan to bring top German scientists to United States to aid military research and development. Small group of German rocket specialists brought to United States under Project Paperclip to work on missile development at Fort Bliss and White Sands Proving Ground. 1946 January 11 - . Launch Vehicle: Hermes missile. Hermes Mach 3 ramjet proposed. - . Nation: USA. Related Persons: von Braun. Von Braun briefs Hermes; V-2 first stage, ramjet second stage, cruise at 3400 kph at 19 km altitude..
1946 January 16 - . Launch Site: White Sands. Launch Complex: White Sands. Launch Vehicle: V-2. V-2 flight tests in US initiated. - . Nation: Germany. Related Persons: von Braun. U.S. upper atmosphere research program initiated with captured German V-2 rockets. A V-2 panel of representatives of various interested agencies was created, and a total of more than 60 V-2's were fired before the supply ran out. The Applied Physics Laboratory of Johns Hopkins University then undertook to develop a medium-altitude rocket, the Aerobee, while the Naval Research Laboratory (NRL) directed its efforts to the development of a large high-altitude rocket, first called the Neptune, later the Viking. 1946 February 21 - . Launch Site: White Sands. Launch Complex: White Sands. Launch Vehicle: V-2. Peenenmuende team arrives in White Sands - . Nation: USA. Related Persons: von Braun. 1946 March 15 - . Launch Site: White Sands. Launch Complex: White Sands LC33. Launch Vehicle: V-2. V-2 static fired - . Nation: Germany. Related Persons: von Braun. First American-assembled V-2 static fired at White Sands Proving Ground..
1946 October 1 - . Launch Site: White Sands. Launch Complex: White Sands. Launch Vehicle: V-2. Project Bumper initiated. - . Nation: USA. Related Persons: von Braun. Army Ordnance initiated Bumper Project for development leading to a two-stage rocket test vehicle, which resulted in use of JPL WAC Corporal as second stage of a V-2..
1947 March 1 - . Von Braun marries Maria von Quistorp. - . Nation: USA. Related Persons: von Braun. Von Braun had mailed a marriage proposal to the 18-year old the previous year They were married her in a local Lutheran church. In December 1948, his first daughter, Iris was born at Fort Bliss Army Hospital..
1948 March 18 - . Launch Vehicle: V-2. V-2 project winding down. - . Nation: Germany. Related Persons: von Braun. V-2 Upper Atmosphere Research Panel, representing all U.S. interested agencies, was renamed the Upper Atmosphere Rocket Research Panel.. Awakening public interest in the United States and in Europe in manned spaceflight. - . Nation: USA. Related Persons: Clarke, Haber, Ley, von Braun, Whipple. Spacecraft: Von Braun Station. Awakening public interest in the United States and in Europe was manifested by publication in September 1949 of The Conquest of Space by Willy Ley. Ley featured detailed descriptions of orbital space stations and manned flights to the Moon and back as part of man's quest to conquer the frontier of space. The First Symposium on Space Flight was held 12 October 1951 at the Hayden Planetarium in New York City. Papers read at the Symposium were published in March 1952 by Collier's magazine under the title 'Man Will Conquer Space Soon.' Contributors were Wernher von Braun, Joseph Kaplan, Heinz Haber, Willy Ley, Oscar Schachter, and Fred L. Whipple. Topics ranged from manned orbiting space station) and orbiting astronomical observatories to problems of human survival in space, lunar space ventures, and questions of international law and sovereignty in space. Finally, Arthur C. Clarke's The Exploration of Space, first published in England in 1951 and a Book of the Month Club selection in America the following year, persuasively argued the case for orbital space stations and manned lunar and planetary space expeditions, popularizing the notion of space flight in general. 1950 July 19 - . Launch Site: Cape Canaveral. Launch Complex: Cape Canaveral. Launch Vehicle: V-2. First attempted launch from Cape Canaveral. - . Payload: WAC-Corporal. Nation: USA. Related Persons: von Braun. Program: Bumper. Class: Technology. Type: Navigation technology satellite. Pad abort on 19 July of Bumper No. 8, a German V-2 with a 320 kg Army-JPL Wac Corporal. Launch scrubbed first due to emergency landing of aircraft in the range; second attempt, no lift, main chamber did not ignite..
1950 October 12 - . LV Family: von Braun concept vehicle. Launch Vehicle: Von Braun 1948. First Symposium on Space Flight - . Nation: USA. Related Persons: Haber, Ley, von Braun. The First Symposium on Space Flight was held at the Hayden Planetarium in New York City. Participants included Wernher von Braun, Joseph Kaplan, Heinz Haber, Willy Ley, Oscar Schachter, and Fred L. Whipple. Among the topics discussed were an orbiting astronomical observatory, problems of survival in space, circumlunar flight, a manned orbiting space station, and the question of sovereignty in outer space. 1951 October 12 - . First Symposium on Space Flight at the Hayden Planetarium in New York City. - . Nation: USA. Related Persons: Ley, von Braun. Spacecraft: Von Braun Station. The Von Braun rocket, space station, and lunar lander designs presented were popularised in the series in Colliers magazine, illustrated with gorgeous Chesley Bonestell paintings, in 1953..
1952 February 11 - . LV Family: von Braun concept vehicle. Launch Vehicle: Von Braun 1952. Collier's Man Will Conquer Space Soon - . Nation: USA. Related Persons: Ley, von Braun. Collier's magazine published papers from First Symposium on Space Flight, under the title "Man Will Conquer Space Soon.". This was an important step in the popularization of the idea of manned space flight..
1955 March 9 - . Man in Space televised. - . Nation: USA. Related Persons: von Braun. Walt Disney's weekly television series aired the first of three programs related to spaceflight. 'Man in Space,' with Wernher Von Braun as technical adviser, drew an estimated audience of 42 million..
1955 March 16 - . Man and the Moon televised. - . Nation: USA. Related Persons: von Braun. The second Walt Disney / Wernher Von Braun program presented the powerful image of a wheelike space station as a launching point for a mission to the Moon..
1955 April 14 - . Wernher von Braun becomes a US citizen. - . Nation: USA. Related Persons: von Braun. 1955 August 1 - . Launch Vehicle: Vanguard. Vanguard selected to launch first US satellite. - . Nation: USA. Related Persons: von Braun. Program: Vanguard. Class: Technology. Type: Navigation technology satellite. Spacecraft: Vanguard 1. Ad Hoc Committee on Special Capabilities rejects Army/Von Brauns's Project Orbiter (Redstone) and USAF Atlas proposals; selects Navy/Vanguard for first US satellite..
1957 April - . Launch Vehicle: Saturn I. Studies of a large clustered-engine booster - . Nation: USA. Related Persons: von Braun. Program: Apollo. The U.S. Army Ballistic Missile Agency, Redstone Arsenal, Ala., began studies of a large clustered-engine booster to generate 1.5 million pounds of thrust, as one of a related group of space vehicles. During 1957-1958, approximately 50,000 man-hours were expended in this effort. 1957 December 4 - . Mars and Beyond televised. - . Nation: USA. Related Persons: von Braun. The final show in the Walt Disney / Wernher Von Braun series was broadcast after the launch of Sputnik 1 but before Von Braun's own Explorer 1 was orbited. It treated a mass audience to Von Braun's plans for a manned expedition to Mars..
1957 December 30 - . Launch Vehicle: Saturn I.
Saturn I first proposed. - . Nation: USA. Related Persons: von Braun. Program: Apollo. Von Braun produces 'Proposal for a National Integrated Missile and Space Vehicle Development Plan'. First mention of 1,500,000 lbf booster (Saturn I). 1958 July 29 - . Launch Vehicle: Saturn I.
Saturn I initial contract. - . Nation: USA. Related Persons: von Braun. Program: Apollo. ARPA gives Von Braun team contract to develop Saturn I (called 'cluster's last stand' due to design concept)..
1958 August 15 - . Launch Vehicle: Saturn I.
Saturn I project initiated by ARPA. - . Nation: USA. Related Persons: von Braun. Program: Apollo. The Advanced Research Projects Agency ARPA provided the Army Ordnance Missile Command (AOMC) with authority and initial funding to develop the Juno V (later named Saturn launch vehicle. ARPA Order 14 described the project: "Initiate a development program to provide a large space vehicle booster of approximately 1.5 million pounds of thrust based on a cluster of available rocket engines. The immediate goal of this program is to demonstrate a full-scale captive dynamic firing by the end of calendar year 1959." Within AOMC, the Juno V project was assigned to the Army Ballistic Missile Agency at Redstone Arsenal Huntsville, Ala.
1958 September 1 - . Launch Vehicle: Saturn I.
Redstone Arsenal begins Saturn I design studies. - . Nation: USA. Related Persons: von Braun. Program: Apollo. Saturn design studies authorized to proceed at Redstone Arsenal for development of 1.5-million-pound-thrust cluster first stage..
1958 September 23 - . Launch Vehicle: Saturn I.
Juno V project objective changed to multistage carrier vehicle - . Nation: USA. Related Persons: Johnson, Roy, Medaris, von Braun. Program: Horizon. Following a Memorandum of Agreement between Maj. Gen. John B. Medaris of Army Ordnance Missile Command (AOMC) and Advanced Research Projects Agency (ARPA) Director Roy W. Johnson on this date and a meeting on November 4, ARPA and AOMC representatives agreed to extend the Juno V project. The objective of ARPA Order 14 was changed from booster feasibility demonstration to "the development of a reliable high performance booster to serve as the first stage of a multistage carrier vehicle capable of performing advanced missions." 1958 October 6 - . Negotiations for Redstone and Jupiter launch vehicles for Mercury project. - . Nation: USA. Related Persons: von Braun. Spacecraft: Mercury. Personnel from the Langley Research Center visited the Army Ballistic Missile Agency to open negotiations for procuring Redstone and Jupiter launch vehicles for manned satellite projects..
1958 December 2 - . Redstone and Jupiter launch vehicle use on Mercury discussed. - . Nation: USA. Related Persons: von Braun. Spacecraft: Mercury. Space Task Group officials visited the Army Ballistic Missile Agency to determine the feasibility of using the Jupiter launch vehicle for the intermediate phase of Project Mercury, to discuss the Redstone program, and to discuss the cost for Redstone and Jupiter launch vehicles. 1958 December 3 - . Army / NASA cooperative agreements - . Nation: USA. Related Persons: Glennan, von Braun. Program: Apollo. Secretary of the Army Wilber M. Brucker and NASA Administrator T. Keith Glennan signed cooperative agreements concerning NASA, Jet Propulsion Laboratory, Army Ordnance Missile Command AOMC, and Department of the Army relationships. The agreement covering NASA utilization of the von Braun team made "the AOMC and its subordinate organizations immediately, directly, and continuously responsive to NASA requirements." 1958 December 15 - . Launch Vehicle: Saturn I.
ABMA Briefing to NASA - . Nation: USA. Related Persons: von Braun. Program: Apollo. Class: Manned. Type: Manned space station. Von Braun briefs NASA on plans for booster development at Huntsville with objective of manned lunar landing. Initally proposed using 15 Juno V (Saturn I) boosters to assemble 200,000 kg payload in earth orbit for direct landing on moon..
1958 December 17 - . Launch Vehicle: Saturn I. Military and NASA consider future launch vehicles - . Nation: USA. Related Persons: von Braun. Program: Apollo. Representatives of Advanced Research Projects Agency, the military services, and NASA met to consider the development of future launch vehicle systems. Agreement was reached on the principle of developing a small number of versatile launch vehicle systems of different thrust capabilities, the reliability of which could be expected to be improved through use by both the military services and NASA. 1959 January 2 - . Von Braun predicted manned circumlunar flight within ten years - . Nation: USA. Related Persons: Glennan, Silverstein, von Braun. Program: Apollo. In a staff report of the House Select Committee on Astronautics and Space Exploration, Wernher von Braun of the Army Ballistic Missile Agency predicted manned circumlunar flight within the next eight to ten years and a manned lunar landing and return mission a few years thereafter. Administrator T. Keith Glennan, Deputy Administrator Hugh L. Dryden, Abe Silverstein, John P. Hagen, and Homer E. Newell, all of NASA, also foresaw manned circumlunar flight within the decade as well as instrumented probes soft-landed on the moon. Roy K. Knutson, Chairman of the Corporate Space Committee, NAA, projected a manned lunar landing expedition for the early 1970's with extensive unmanned instrumented soft lunar landings during the last half of the 1960's. 1959 January 6 - . Launch Vehicle: Saturn I.
NASA Large Booster Review Committee - . Nation: USA. Related Persons: von Braun. Program: Apollo. The Army Ordnance Missile Command (AOMC), the Air Force, and missile contractors presented to the ARPA-NASA Large Booster Review Committee their views on the quickest and surest way for the United States to attain large booster capability. The Committee decided that the Juno V approach advocated by AOMC was best and NASA started plans to utilize the Juno V booster. 1959 January 16 - . Eight Redstone and two Jupiter launch vehicles for Mercury - . Nation: USA. Related Persons: von Braun. Spacecraft: Mercury. NASA requested the Army Ordnance Missile Command, Huntsville, Alabama, to construct and launch eight Redstone launch vehicles and two Jupiter launch vehicles in support of Project Mercury manned and unmanned flights..
1959 February 2 - . Launch Vehicle: Saturn I. Booster name changed from Juno V to Saturn - . Nation: USA. Related Persons: Johnson, Roy, von Braun. Program: Apollo. The Army proposed that the name of the large clustered-engine booster be changed from Juno V to Saturn, since Saturn was the next planet after Jupiter. Roy W. Johnson, Director of the Advanced Research Projects Agency, approved the name on February 3..
1959 February 4 - . Launch Vehicle: Saturn I. Early agreement required on Saturn upper stages - . Nation: USA. Related Persons: Johnson, Roy, Medaris, von Braun. Program: Apollo. Maj. Gen. John B. Medaris of the Army Ordnance Missile Command (AOMC) and Roy W. Johnson of the Advanced Research Projects Agency (ARPA) discussed the urgency of early agreement between ARPA and NASA on the configuration of the Saturn upper stages. Several discussions between ARPA and NASA had been held on this subject. Johnson expected to reach agreement with NASA the following week. He agreed that AOMC would participate in the overall upper stage planning to ensure compatibility of the booster and upper stages. 1959 February 11 - . Redstone and Jupiter flight phases of Project Mercury. - . Nation: USA. Related Persons: von Braun. Spacecraft: Mercury. Space Task Group and Army Ballistic Missile Agency personnel met at Huntsville, Alabama, to discuss Redstone and Jupiter flight phases of Project Mercury. During the course of the meeting the following points became firm: (1) Space Task Group was the overall manager and technical director of this phase of the program, (2) ABMA was responsible for the launch vehicle until spacecraft separation, (3) ABMA was responsible for the Redstone launch vehicle recovery (this phase of the program was later eliminated since benefits from recovering the launch vehicle would have been insignificant), (4) Space Task Group was responsible for the spacecraft flight after separation, (5) McDonnell was responsible for the adapters for the Mercury-Redstone configuration, and (6) ABMA would build adapters for the Mercury-Jupiter configuration. Because many points could only be settled by detailed design studies, it was decided to establish several working panels for later meetings. 1959 March 20 - . Army task force to plan a manned lunar outpost - . Nation: USA. Related Persons: Medaris, von Braun. Program: Horizon. An Army task force was formed to develop a plan for establishing a manned lunar outpost by the quickest practical means. The effort was called Project Horizon. The first phase of the project was to make a limited feasibility study, with estimated time and costs. The task force worked under the direction of Maj. Gen. John B. Medaris of the Army Ordnance Missile Command and in full collaboration with the von Braun team. The report was completed on June 8. 1959 May 1 - . Launch Vehicle: Saturn I.
Unmanned Lunar Soft Landing Vehicle - . Nation: USA. Related Persons: von Braun. Program: Apollo. Spacecraft: Surveyor. The Army Ordnance Missile Command submitted to NASA a report entitled "Preliminary Study of an Unmanned Lunar Soft Landing Vehicle," recommending the use of the Saturn booster..
1959 June 3 - . Launch Vehicle: Saturn I. Construction begins of the first Saturn launch complex - . Nation: USA. Related Persons: von Braun. Program: Apollo. Construction of the first Saturn launch area, Complex 34, began at Cape Canaveral, FIa..
1959 June 8 - . Project Horizon Phase I report - . Nation: USA. Related Persons: von Braun. Program: Horizon. 1959 June 25-26 - . LV Family: Saturn I. Launch Vehicle: Saturn C-2. 1959 July 1 - . LV Family: Jupiter. Launch Vehicle: Jupiter IRBM. Jupiter launch vehicles in Project Mercury canceled - . Nation: USA. Related Persons: von Braun. Spacecraft: Mercury. The order for Jupiter launch vehicles in support of Project Mercury was canceled because the same or better data could be obtained from Atlas flights..
1959 October 21 - . Launch Vehicle: Saturn I. Transfer to NASA of the Army Ballistic Missile Agency's Development Operations Division - . Nation: USA. Related Persons: Eisenhower, von Braun. Program: Apollo. After a meeting with officials concerned with the missile and space program, President Dwight D. Eisenhower announced that he intended to transfer to NASA control the Army Ballistic Missile Agency's Development Operations Division personnel and facilities. The transfer, subject to congressional approval, would include the Saturn development program. 1959 November 2 - . Launch Vehicle: Saturn I. Transfer of Saturn I project to NASA announced. - . Nation: USA. Related Persons: Eisenhower, von Braun. Program: Apollo. President Eisenhower announced his intention of transferring the Saturn project to NASA, which became effective on March 15, 1960..
1959 December 6 - . Launch Vehicle: Saturn I. Plan for transferring the Army Ballistic Missile Agency and Saturn to NASA - . Nation: USA. Related Persons: Eisenhower, Glennan, von Braun. Program: Apollo. The initial plan for transferring the Army Ballistic Missile Agency and Saturn to NASA was drafted. It was submitted to President Dwight D. Eisenhower on December 1 1 and was signed by Secretary of the Army Wilber M. Brucker and Secretary of the Air Force James H. Douglas on December 16 and by NASA Administrator T. Keith Glennan on December 17. 1959 December 7 - . Launch Vehicle: Saturn I. Engineering and cost study for a new Saturn configuration - . Nation: USA. Related Persons: von Braun. Program: Apollo. 1959 December 8-9 - . LV Family: Saturn I. Launch Vehicle: Saturn C-2. Army Ballistic Missile Agency mission possibilities - . Nation: USA. Related Persons: von Braun. Program: Apollo. H. H. Koelle told members of the Research Steering Committee of mission possibilities being considered at the Army Ballistic Missile Agency. These included an engineering satellite, an orbital return capsule, a space crew training vehicle, a manned orbital laboratory, a manned circumlunar vehicle, and a manned lunar landing and return vehicle. He described the current Saturn configurations, including the "C" launch vehicle to be operational in 1967. The Saturn C (larger than the C-1) would be able to boost 85,000 pounds into earth orbit and 25,000 pounds into an escape trajectory. 1959 December 15 - . Launch Vehicle: Saturn I.
Saturn upper stage study. - . Nation: USA. Related Persons: von Braun. Program: Apollo. NASA team completed study design of upper stages of Saturn launch vehicle..
1959 December 31 - . Launch Vehicle: Saturn V.
NASA approval of Saturn development program - . Nation: USA. Related Persons: Silverstein, von Braun. Program: Apollo. NASA accepted the recommendations of the Saturn Vehicle Evaluation Committee Silverstein Committee on the Saturn C-1 configuration and on a long-range Saturn program. A research and development plan of ten vehicles was approved. The C-1 configuration would include the S-1 stage (eight H-1 engines clustered, producing 1.5 million pounds of thrust), the S-IV stage (four engines producing 80,000 pounds of thrust), and the S-V stage two engines producing 40,000 pounds of thrust. 1960 January 14 - . Launch Vehicle: Saturn V.
Super booster program to be accelerated - . Nation: USA. Related Persons: Eisenhower, Glennan, von Braun. Program: Apollo. President Dwight D. Eisenhower directed NASA Administrator T. Keith Glennan "to make a study, to be completed at the earliest date practicable, of the possible need for additional funds for the balance of FY 1960 and for FY 1961 to accelerate the super booster program for which your agency recently was given technical and management responsibility." 1960 February 15 - . Launch Vehicle: Saturn V.
Lunar Program Based on Saturn Systems - . Nation: USA. Related Persons: von Braun. Program: Apollo. Class: Manned. Type: Manned space station. Spacecraft: Apollo Lunar Landing. Study issued by Huntsville of lunar landing alternatives using Saturn systems. Huntsville transferred from Army to NASA. Vought study on modular approach to lunar landing. Internally NASA decides on lunar landing as next objective after Mercury..
1960 March 15 - . Launch Vehicle: Saturn I.
Saturn I transferred to NASA. - . Nation: USA. Related Persons: von Braun. Program: Apollo. The Army Ballistic Missile Agency's Development Operations Division and the Saturn program were transferred to NASA after the expiration of the 60-day limit for congressional action on the President's proposal of January 14. (The President's decision had been made on October 21, 1959.) By Executive Order, the President named the facilities the "George C. Marshall Space Flight Center." Formal transfer took place on July 1. 1960 May 2 - . Proposed advanced manned spacecraft program presented to von Braun - . Nation: USA. Related Persons: von Braun. Program: Apollo. Spacecraft: Apollo CSM, CSM Source Selection. Members of STG presented the proposed advanced manned spacecraft program to Wernher von Braun and 25 of his staff at Marshall Space Flight Center. During the ensuing discussion, the merits of a completely automatic circumlunar mission were compared with those of a manually operated mission. Further discussions were scheduled. 1960 May 26 - . Launch Vehicle: Saturn I. Assembly of the first Saturn flight booster began - . Nation: USA. Related Persons: von Braun. Program: Apollo. Assembly of the first Saturn flight booster, SA-1, began at Marshall Space Flight Center..
1960 June 15 - . Launch Vehicle: Saturn I.
Saturn C-1 first stage completed test series - . Nation: USA. Related Persons: von Braun. Program: Apollo. The Saturn C-1 first stage successfully completed its first series of static tests at the Marshall Space Flight Center with a 122-second firing of all eight H-1 engines..
1960 November 29 - . Briefing on the Apollo and Saturn programs - . Nation: USA. Related Persons: Faget, von Braun. Program: Apollo. Spacecraft: Apollo CSM, CSM Source Selection, LM Mode Debate, LM Source Selection. A joint briefing on the Apollo and Saturn programs was held at Marshall Space Flight Center MSFC, attended by representatives of STG and MSFC. Maxime A. Faget of STG and MSFC Director Wernher von Braun agreed that a joint STG-MSFC program would be developed to accomplish a manned lunar landing. Areas of responsibility were: MSFC launch vehicle and landing on the moon; STG - lunar orbit, landing, and return to earth. 1960 December 2 - . Launch Vehicle: Saturn I.
Saturn I static firing. - . Nation: USA. Related Persons: von Braun. Program: Apollo. First of new series of static firings of Saturn considered only 50 percent successful in 2-second test at MSFC..
1961 January 5-6 - . Manned lunar landing discussed with Space Exploration Program Council - . Nation: USA. Related Persons: Faget, von Braun. Program: Apollo. Spacecraft: Apollo LM, LM Mode Debate, LM Source Selection. During a meeting of the Space Exploration Program Council at NASA Headquarters, the subject of a manned lunar landing was discussed. Following presentations on earth orbit rendezvous (Wernher von Braun, Director of Marshall Space Flight Center), lunar orbit rendezvous (John C. Houbolt of Langley Research Center), and direct ascent (Melvyn Savage of NASA Headquarters), the Council decided that NASA should not follow any one of these specific approaches, but should proceed on a broad base to afford flexibility. Another outcome of the discussion was an agreement that NASA should have an orbital rendezvous program which could stand alone as well as being a part of the manned lunar program. A task group was named to define the elements of the program insofar as possible. Members of the group were George M. Low, Chairman, Eldon W. Hall, A. M. Mayo, Ernest O. Pearson, Jr., and Oran W. Nicks, all of NASA Headquarters; Maxime A. Faget of STG; and H. H. Koelle of Marshall Space Flight Center. This group became known as the Low Committee. 1961 January 26 - . Launch Vehicle: Saturn I.
Saturn C-1 changed to a two-stage configuration - . Nation: USA. Related Persons: von Braun. Program: Apollo. Wernher von Braun, Director of Marshall Space Flight Center, proposed that the Saturn C-1 launch vehicle be changed from a three-stage to a two-stage configuration to meet Apollo program schedules. The planned third stage (S-V) would be dropped..
1961 January - . Launch Vehicle: Saturn I.
Saturn first stage recovery system study - . Nation: USA. Related Persons: von Braun. Program: Apollo. Marshall Space Flight Center awarded contracts to NAA and Ryan Aeronautical Corporation to investigate the feasibility of recovering the first stage (S-I) of the Saturn launch vehicle by using a Rogallo wing paraglider..
1961 March 1 - . LV Family: Saturn I. Launch Vehicle: Saturn C-2. Current Saturn launch vehicle configurations announced - . Nation: USA. Related Persons: von Braun. Program: Apollo. S-I stage eight H-1 engines, 1.5 million pounds of thrust; S-IV stage four (LR-119 engines, 70,000 pounds of thrust); and S-V stage (two LR-119 engines, 35,000 pounds of thrust). S-1 stage (same as first stage of the C-1); S-II (not determined); S-IV (same as second stage of the C-1); S-V (same as third Stage of C- 1). S-I (same as first stage of C-1); S-II (not determined); and S-IV (same as third stage of C-1). 1961 March 23 - . LV Family: Saturn I. Launch Vehicle: Saturn C-2. Configuration changes for the Saturn C-1 launch vehicles - . Nation: USA. Related Persons: von Braun. Program: Apollo. Elimination of third-stage development, since two stages could put more than ten tons into earth orbit. Use of six LR-115 (15,000-pound) Centaur engines (second-stage thrust thus increased from 70,000 to 90,000 pounds). Redesign of the first stage (S-1) to offer more safety for manned missions. Plans were also presented to accelerate the development of the Saturn C- 2, and a recommendation was made that a prime contractor be selected to work on the second stage (S-II) of the C-2. NASA Headquarters approved the C-2 plans on March 31. 1961 March 24 - . Mercury MR-3A (cancelled) - . Call Sign: Freedom 7. Crew: Shepard. Backup Crew: Grissom. Payload: Mercury SC7. Nation: USA. Related Persons: von Braun. Flight: Mercury MR-3A. Spacecraft: Mercury. After booster problems on the Mercury MR-2 chimp test flight, Von Braun insisted on a further unmanned booster test flight, against the wishes of Shepard and others at NASA. A Mercury boilerplate capsule was launched on a flawless test on 24 March. If NASA had overruled Von Braun, the manned Freedom 7 capsule would have flown instead. Shepard would have been the first man in space (though not in orbit), beating Gagarin's flight by three weeks. 1961 April 6 - . Launch Vehicle: Saturn V.
1,640 million pounds of thrust achieved in static- firing of the F-1 engine - . Nation: USA. Related Persons: von Braun. Program: Apollo. The Marshall Space Flight Center announced that 1.640 million pounds of thrust was achieved in a static- firing of the F-1 engine thrust chamber at Edwards Air Force Base, Calif. This was a record thrust for a single chamber..
1961 April 28 - . Launch Vehicle: Saturn I.
Dynasoar launch by Saturn I studied. - . Nation: USA. Related Persons: von Braun. Class: Manned. Type: Manned spaceplane. Spacecraft: Dynasoar. Final NASA report on the study proposed for Saturn for use as Dyna-Soar booster was presented to the Air Force..
1961 April - . Launch Vehicle: Saturn I. Air transport of the Saturn C-1 second stage feasible - . Nation: USA. Related Persons: von Braun. Program: Apollo. The Douglas Aircraft Company reported that air transport of the Saturn C-1 second stage (S-IV) was feasible..
1961 May - . Launch Vehicle: Saturn V.
Reevaluation of the Saturn C-2 to support circumlunar missions - . Nation: USA. Related Persons: von Braun. Program: Apollo. The Marshall Space Flight Center began reevaluation of the Saturn C-2 configuration capability to support circumlunar missions. Results showed that a Saturn vehicle of even greater performance would be desirable..
1961 June 1 - . Launch Vehicle: Saturn I. Change in the Saturn C-1 configuration - . Nation: USA. Related Persons: von Braun. Program: Apollo. NASA announced a change in the Saturn C-1 vehicle configuration. The first ten research and development flights would have two stages, instead of three, because of the changed second stage (S-IV) and, starting with the seventh flight vehicle, increased propellant capacity in the first stage (S-1) booster. 1961 June 5 - . Launch Site: Cape Canaveral. Launch Complex: Cape Canaveral LC34. Launch Vehicle: Saturn I.
Saturn I launch complex completed. - . Nation: USA. Related Persons: von Braun. Program: Apollo. Huge Saturn launch complex at Cape Canaveral dedicated in brief ceremony by NASA, construction of which was supervised by the Army Corps of Engineers. Giant gantry, weighing 2,800 tons and being 310 feet high, is largest movable land structure in North America. 1961 June 23 - . Launch Vehicle: Saturn I.
Saturn C-1 to be operational in 1964 - . Nation: USA. Related Persons: von Braun. Program: Apollo. NASA announced that the Saturn C-1 launch vehicle, which could place ten-ton payloads in earth orbit, would be operational in 1964..
1961 June 23 - . LV Family: Saturn I. Launch Vehicle: Saturn C-2. Saturn C-2 discontinued - . Nation: USA. Related Persons: von Braun. Program: Apollo. Spacecraft: Apollo Lunar Landing. NASA announced that further engineering design work on the Saturn C-2 configuration would be discontinued and that effort instead would be redirected toward clarification of the Saturn C-3 and Nova concepts. Investigations were specifically directed toward determining capabilities of the proposed C-3 configuration in supporting the Apollo mission. 1961 July 6 - . Manned Lunar Landing Coordination Group - . Nation: USA. Related Persons: Low, George, von Braun. Program: Apollo. Begin Nova systems integration studies and develop the general arrangement of second and third stages. The studies should include spacecraft propulsion stages and spacecraft. Begin Saturn C-3 systems integration studies. Continue Launch Operations Directorate-Air Force Missile Test Center studies of Nova and C-3 launch sites at Atlantic Missile Range (AMR). Take steps to bring the contractor aboard as soon as possible for Nova and C-3 launch facility and test stand designs. Accelerate F-1 engine funding to provide adequate production engines for the Nova and C-3. Examine the Marshall Space Flight Center (MSFC) proposal for static test facilities for large vehicle stages with a view toward beginning detailed site examination. Accelerate funding of the J-2 engine to provide acceptance test stands. Determine the necessity for a one-million-pound-thrust liquid- hydrogen - liquid-oxygen engine. Begin design studies on spacecraft propulsion systems and develop specifications. Define management responsibilities. Begin preparations for letting the contract for a spacecraft operations facility at AMR. Determine the relationships and responsibilities of MSFC and STG on guidance and control. 1961 July 11 - . Launch Vehicle: Saturn V.
F-1 engine begins static testing. - . Nation: USA. Related Persons: von Braun. Program: Apollo. NASA announced that a complete F-1 engine had begun a series of static test firings at Edwards Rocket Test Center, Calif..
1961 July 24 - . LV Family: Saturn I. Launch Vehicle: Saturn C-2. Stages S-IB (3 million pounds of thrust), S-II, and S-IV. 1961 August 5 - . Launch Vehicle: Saturn I. First Saturn I leaves factory. - . Nation: USA. Related Persons: von Braun. Program: Apollo. First Saturn (SA-1) booster began water trip to Cape Canaveral on Navy barge Compromise after overland detour around Wheeler Dam..
1961 August 14 - . Launch Site: Cape Canaveral. Launch Complex: Cape Canaveral. Launch Vehicle: Saturn I. First Saturn I arrives at Cape Canaveral. - . Nation: USA. Related Persons: von Braun. Program: Apollo. Navy barge Compromise, carrying first Saturn booster, stuck in the mud in the Indian River just south of Cape Canaveral. Released several hours later, the Saturn was delayed only 24 hours in its 2,200-mile journey from Huntsville..
1961 September 11 - . Launch Vehicle: Saturn V.
North American selected to build S-II stage. - . Nation: USA. Related Persons: von Braun. Program: Apollo. Spacecraft: Apollo Lunar Landing. NASA selected NAA to develop the second stage (S-II) for the advanced Saturn launch vehicle. The cost, including development of at least ten vehicles, would total about $140 million. The S-II configuration provided for four J-2 liquid-oxygen - liquid-hydrogen engines, each delivering 200,000 pounds of thrust. 1961 September 25 - . Launch Vehicle: Saturn V.
S-IC fabrication plant manager named. - . Nation: USA. Related Persons: von Braun. Program: Apollo. Dr. George N. Constan of Marshall Space Flight Center named as acting manager of the new NASA Saturn fabrication plant near New Orleans by Director von Braun of Marshall Space Flight Center..
1961 October 3 - . The Charter of the MSFC-STG Space Vehicle Board approved - . Nation: USA. Related Persons: Rees, von Braun. Program: Apollo. Management of the SFC-STG Apollo-Saturn program. Resolution of all space vehicle problems, such as design systems, research and development tests, planning, schedules, and operations. Direction of the respective organizational elements in the conduct of the MSFC-STG Apollo-Saturn program, including approval of the Sub- Board and of the Coordination Panels. Formation of the Advanced Program Coordination Board consisting of top personnel from MSFC and STG. This Board would consider policy and program guidelines. A Sub-Board would comprise the Director, Saturn Systems Office, MSFC (H. H. Koelle), the Apollo Project Manager, STG (Robert O. Piland), the Board Secretary, and alternate Board Secretary. Resolve space-vehicle coordination and integration problems and assign these to the Coordination Panels, if required. Prepare briefs in problem areas not resolved by the Board or Sub- Board. Act as a technical advisory group to the Board. Channel the decisions of the Board through the respective organizational elements of MSFC or STG for proper action. Ensure that the Saturn-Apollo Coordination Panels were working adequately and within the scope of their charters. Recommend to the Board modifications of the Panels. Define or resolve systems or integration problems of the Saturn launch vehicle and the Apollo spacecraft. Define mission objectives of the Saturn-Apollo space vehicle. Analyze and report progress of the Saturn-Apollo space vehicle. Initiate and guide studies for the selection of optimum Saturn- Apollo space vehicle systems. Define and establish reliability criteria. Establish and document flight safety philosophy. The Secretariat set up under the Charter was to be responsible for the orderly conduct of business and meetings. Four Saturn-Apollo Coordination Panels were established to make available the technical competence of MSFC and STG for the solution of interrelated problems of the launch vehicle and the spacecraft. The four included the Launch Operations, Mechanical Design, Electrical and Electronics Design, and Flight Mechanics, Dynamics, and Control Coordination Panels. Although these Panels were designated as new Panels, the members selected by STG and MSFC represented key technical personnel who had been included in the Mercury-Redstone Panels, the Mercury-Atlas Program Panels, the Apollo Technical Liaison Groups, and the Saturn working groups. The Charter was signed by von Braun and Gilruth. Charter of the MSFC-STG Space Vehicle Board, October 3, 1961. 1961 November 16 - . Launch Vehicle: Saturn V.
Second decision on launch vehicles - . Nation: USA. Related Persons: McNamara, von Braun, Webb. Program: Apollo. Class: Manned. Type: Manned space station. Golovin Committe studies launch vehicles through summer, but found the issue to be completely entertwined with mode (earth-orbit, lunar-orbit, lunar-surface rendezvous or direct flight. Two factions: large solids for direct flight; all-chemical with 4 or 5 F-1's in first stage for rendezvous options. In the end Webb and McNamara ordered development of C-4 and as a backup, in case of failure of F-1 in development, build of 6.1 m+ solid rocket motors by USAF. 1961 November 17 - . Launch Vehicle: Saturn I. Contract issued for build of 20 Saturn I's. - . Nation: USA. Related Persons: von Braun. Program: Apollo. NASA announced that the Chrysler Corporation had been chosen to build 20 Saturn first-stage (S-1) boosters similar to the one tested successfully on October 27 . They would be constructed at the Michoud facility near New Orleans, La. The contract, worth about $200 million, would run through 1966, with delivery of the first booster scheduled for early 1964. 1961 December 15 - . Launch Vehicle: Saturn V.
Boeing named contractor for Saturn C-5 first stage (S-IC) - . Nation: USA. Related Persons: von Braun. Program: Apollo. Spacecraft: Apollo Lunar Landing. NASA announced that The Boeing Company had been selected for negotiations as a possible prime contractor for the first stage (S-IC) of the advanced Saturn launch vehicle. The S-IC stage, powered by five F-1 engines, would be 35 feet in diameter and about 140 feet high. The $300-million contract, to run through 1966, called for the development, construction, and testing of 24 flight stages and one ground test stage. The booster would be assembled at the NASA Michoud Operations Plant near New Orleans, La., under the direction of the Marshall Space Flight Center. 1961 December 20 - . Launch Vehicle: Saturn V.
Douglas named contractor for Saturn S-IVB stage - . Nation: USA. Related Persons: von Braun. Program: Apollo. Spacecraft: Apollo Lunar Landing. NASA announced that Douglas Aircraft had been selected for negotiation of a contract to modify the Saturn S-IV stage by installing a single 200,000-pound-thrust, Rocketdyne J-2 liquid-hydrogen/liquid-oxygen engine instead of six 15,000-pound-thrust P. & W. hydrogen/oxygen engines. Known as S-IVB, this modified stage will be used in advanced Saturn configurations for manned circumlunar Apollo missions. 1961 December 21 - . Saturn C-5 launch vehicle configuration selected - . Nation: USA. Related Persons: Rosen, Milton, von Braun. Program: Apollo. Spacecraft: Apollo Lunar Landing. Rosen Committee studies in November and December indicated that the most flexible choice for Apollo was the Saturn C-4, with two required for the earth orbit rendezvous approach or one for the lunar orbit rendezvous mission, with a smaller landed payload. The panel rejected solid motors again, but Rosen himself still pushed for Nova. An extra F-1 engine was 'slid in' for insurance, resulting in the Saturn C-5 configuration. The Manned Space Flight Management Council decided at its first meeting that the Saturn C-5 launch vehicle would have a first stage configuration of five F-1 engines and a second stage configuration of five J-2 engines. The third stage would be the S-IVB with one J-2 engine. It recommended that the contractor for stage integration of the Saturn C-1 be Chrysler Corporation and that the contractor for stage integration of the Saturn C-5 be The Boeing Company. Contractor work on the Saturn C-5 should proceed immediately to provide a complete design study and a detailed development plan before letting final contracts and assigning large numbers of contractor personnel to Marshall Space Flight Center or Michoud. Formation of the Manned Space Flight Management Council - . Nation: USA. Related Persons: Holmes, Brainard, Rees, Rosen, Milton, Shea, von Braun. Program: Apollo. D. Brainerd Holmes, Director of the NASA Office of Manned Space Flight, announced the formation of the Manned Space Flight Management Council. The Council, which was to meet at least once a month, was to identify and resolve difficulties and to coordinate the interface problems in the manned space flight program. Members of the Council, in addition to Holmes, were: from MSC, Robert R. Gilruth and Walter C. Williams, Director and Associate Director; from Marshall Space Flight Center, Wernher von Braun, Director, and Eberhard F. M. Rees, Deputy Director for Research and Development; from NASA Headquarters, George M. Low, Director of Spacecraft and Flight Missions; Milton W. Rosen, Director of Launch Vehicles and Propulsion; Charles H. Roadman, Director of Aerospace Medicine; William E. Lilly, Director of Program Review and Resources Management; and Joseph F. Shea, Deputy Director for Systems Engineering, Shea, formerly Space Programs Director for Space Technology Laboratories, Inc., Los Angeles, Calif., had recently joined NASA. 1962 February 27 - . Manned Space Flight Management Council meeting - . Nation: USA. Related Persons: Maus, von Braun. Program: Apollo. The Saturn C-5 launch vehicle and earth orbital rendezvous were considered the primary mode for the lunar landing. Full-scale orbit operations development, including ground testing, would be accomplished, using S-I boosters and orbital upper stages. This development would be planned so that upper stages and rendezvous techniques would be developed by the time the C-5 was operational. Planning would consider both connecting and fueling modes. The development of a two-stage Nova with liquid-propellant engines in both stages would be activated as early as realistically feasible. This would provide an alternative, direct flight mode carrying the same orbital launch vehicle as developed for the C-5. There would be no solid-propellant vehicle development. Charles W. Frick of MSC and Hans H. Maus of MSFC would coordinate schedule assumptions between the Centers. 1962 March 18 - . Launch Vehicle: Saturn V.
Saturn C-5 first launch scheduled in the last quarter of 1965 - . Nation: USA. Related Persons: von Braun. Program: Apollo. Marshall Space Flight Center's latest schedule on the Saturn C-5 called for the first launch in the last quarter of 1965 and the first manned launch in the last quarter of 1967. If the C-5 could be man-rated on the eighth research and development flight in the second quarter of 1967, the spacecraft lead time would be substantially reduced. 1962 May 4 - . Titov in Baltimore - . Nation: Russia. Related Persons: Glenn, Titov, von Braun. Spacecraft: Mercury, Vostok. Titov and Kamanin meet journalist Drew Pierson, who claims that five Soviet cosmonauts died before Gagarin flew. They are introduced to Wernher Von Braun. In the afternoon they go to a barbecue at Glenn's house in Virginia. Kamanin carefully notes the technical information he has gleaned: Glenn wore no parachute; the Mercury's solid fuel retrorockets fire in 28 seconds, much more quickly and with more force than the Vostok's low-thrust liquid propellant engine; it is planned to launch a modernised version of Mercury on a one-day flight by the end of 1962; the astronauts train in the centrifuge to 16 G's (versus 12 G's for the cosmonauts); the NASA manned space headquarters is moving to Texas; Mercury is only capable of water landings, no work has been done on land landings or equipping the capsule with an ejection seat; several Amerrican women are considered fit for spaceflight, and the first American woman could make a three-orbit flight in the second half of 1962. 1962 June 7 - . von Braun recommends lunar orbit rendezvous mode for Apollo - . Nation: USA. Related Persons: von Braun. Program: Apollo. Spacecraft: Apollo CSM, Apollo Lunar Landing, CSM Recovery, CSM SPS. Wernher von Braun, Director, Marshall Space Flight Center, recommended to the NASA Office of Manned Space Flight that the lunar orbit rendezvous mode be adopted for the lunar landing mission. He also recommended the development of an unmanned, fully automatic, one-way Saturn C-5 logistics vehicle in support of the lunar expedition; the acceleration of the Saturn C-1B program; the development of high-energy propulsion systems as a backup for the service module and possibly the lunar excursion module; and further development of the F-1 and J-2 engines to increase thrust or specific impulse. 1962 June 22 - . Lunar orbit rendezvous selected as mode for the Apollo lunar landing mission - . Nation: USA. Related Persons: von Braun. Program: Apollo. Lunar orbit rendezvous, using the Saturn C-5 launch vehicle, should be the mission mode for lunar exploration. The development of a lunar logistics vehicle, using the Saturn C-1B or the C-5 launch vehicle, should be started and a six-month study of this development should begin immediately. Time was too short and the expense too great to develop a parallel backup mode. Study of the Nova vehicle should continue with the expectation that its development would follow the C-5 by two or three years. The C-1B launch vehicle should be started immediately, looking toward the first two-stage flight in mid- 1965. Development of a lunar excursion module should begin at once. These decisions were to be presented to NASA Associate Administrator Robert C. Seamans, Jr., NASA Deputy Administrator Hugh L. Dryden, and NASA Administrator James E. Webb for approval. 1962 August 8 - . Launch Vehicle: Saturn V.
Contract to Douglas for the S-IVB stage - . Nation: USA. Related Persons: von Braun. Program: Apollo. NASA awarded a $141.1 million contract to the Douglas Aircraft Company for design, development, fabrication, and testing of the S-IVB stage, the third stage of the Saturn C-5 launch vehicle. The contract called for 11 S-IVB units, including three for ground tests, two for inert flight, and six for powered flight. 1962 August 16 - . Launch Vehicle: Saturn I.
S-IV successfully static-fired for the first time - . Nation: USA. Related Persons: von Braun. Program: Apollo. The second stage (S-IV) of the Saturn C-1 launch vehicle was successfully static-fired for the first time in a ten-second test at the Sacramento, Calif., facility by the Douglas Aircraft Company..
1963 December 26 - . Launch Vehicle: Saturn V.
Extension of Apollo systems to permit more extensive exploration of the lunar surface. - . Nation: USA. Related Persons: Shea, von Braun. Spacecraft: Apollo LM Shelter, Apollo LM Taxi. 1964 June 19 - . Kamanin on von Braun - . Nation: Russia. Related Persons: von Braun. Kamanin sees an interview with Wernher von Braun, wherein von Braun predicts an American manned moon landing by 1970. He is confident the United State will beat the Russians at this. Kamanin agrees - he sees no possibility of beating the Americans - the Soviet Union is 1 to 2 years behind. 1965 September 11 - . Setbacks - . Nation: Russia. Related Persons: Belyayev, Komarov, Leonov, Ponomaryova, Solovyova, von Braun. Program: Voskhod. Flight: Voskhod 5. Spacecraft: Berkut, Voskhod. Belyayev and Leonov are going to an IAF congress in Greece, where they will unofficially meet Wernher von Braun and several US astronauts. Komarov is touring West Germany. Factory 918 is refusing to fabricate space suits for the female crew for the planned Voskhod EVA flight. They are categorically against the concept. It is necessary to obtain a specific order instructing them to fabricate the suits. 1965 December 1 - . Green light to begin the Saturn IVB Orbital Workshop program - . Nation: USA. Related Persons: Mueller, von Braun. Spacecraft Bus: Skylab. Spacecraft: Orbital Workshop, Skylab. George E. Mueller, Associate Administrator for Manned Space Flight, and MSFC Director Wernher von Braun discussed Marshall's briefing on the S-IVB Workshop concept presented at Headquarters the previous day. Mueller asked that MSFC formulate a program development plan and present it at the next meeting of the Manned Space Flight Management Council. Specifically, Mueller demanded that the plan include experiments to be carried aboard the Workshop; funding arrangements; and where development work should be done (in house, or elsewhere). In addition, he asked that MSFC submit two such plans, one for the unpressurized and another for the pressurized version of the Workshop. In effect, Mueller gave Marshall the 'green light' to begin the Orbital Workshop program. At von Braun's request, the Workshop received the status of a separate project, with William Ferguson as Project Manager. 1966 July 20 - . 1966 October 19 - . Von Braun complains of transfer of Apollo lunar work - . Nation: USA. Related Persons: Mueller, Stuhlinger, von Braun. Program: Apollo. Spacecraft: Apollo CSM. Marshall Space Flight Center Director Wernher von Braun wrote MSC Director Robert R. Gilruth that MSFC had spent a considerable effort in planning the transfer of study and development tasks in the lunar exploration program to MSC. Von Braun said, "We feel it is in the spirit of the MSF Hideaway Management Council Meeting held on August 13-15, 1966, to consider the majority of our Lunar Exploration Work Program for transfer to MSC in consonance with Bob Seamans' directive which designates MSC as the Lead Center for lunar science." He added that MSFC had formulated a proposal which it felt was in agreement with the directives and at the same time provided for management interfaces between the two Centers without difficulty. lunar flying device (one man flying machine). He added that MSFC had been working in specific areas of scientific technology that promised to furnish experiments that could be used on the lunar surface or from lunar orbit as well as from a planetary vehicle for planetary observations. Among these were radar and laser altimetry and infrared spectroscopy. Von Braun said that Ernst Stuhlinger of the Research Projects Laboratory had discussed the proposed actions for transfer of functions to MSC, and MSC Experiments Program Manager Robert O. Piland had indicated his general agreement, pending further consideration. He asked that Gilruth give his reaction to the proposal and said, "It would be very helpful if our two Centers could present a proposal to George Mueller (OMSF) on which we both agree." 1967 July 18 - . 1967 July 27 - . LLRV and LLTV defects - . Nation: USA. Related Persons: von Braun. Program: Apollo. Spacecraft Bus: Apollo LM. Spacecraft: Apollo LLRV. MSC Director Robert R. Gilruth wrote MSFC Director Wernher von Braun that MSC had two lunar landing research vehicles (LLRVs) for crew training and three lunar landing training vehicles (LLTVs) were being procured from Bell Aerosystems Go. Gilruth explained that x-ray inspection of welds on the LLTVs at both Bell and MSC had disclosed apparent subsurface defects, such as cracks and lack of fusion. There was, however, question as to the interpretation of the x-rays and the amount of feasible repair. Gilruth mentioned that James Kingsbury of MSFC had previously assisted MSC in interpreting weldment x-rays, stated that further x-rays were being taken, and asked MSFC assistance in interpreting them and in determining the amount and methods of repair needed. 1968 August 7 - . Launch Vehicle: Saturn V.
George Low promotes idea of flying Apollo 8 as a lunar orbit mission without the Lunar Module - . Nation: USA. Related Persons: von Braun. Program: Apollo. Flight: Apollo 7, Apollo 8, Apollo 9. Spacecraft: Apollo CSM, Apollo LM, CSM Block II, LM Guidance, LM RCS. 1968 August 9 - . Launch Vehicle: Saturn V.
1968 August 14 - . Launch Vehicle: Saturn V.
Apollo senior figures negative on an Apollo 8 lunar mission in December - . Nation: USA. Related Persons: Debus, Low, George, von Braun. Program: Apollo. Flight: Apollo 8. Spacecraft: Apollo CSM. 1969 July 21 - . Launch Vehicle: N1. Soviet engineers view moonwalk - . Nation: Russia. Related Persons: Mishin, Tyulin, von Braun. Program: Lunar L3. Flight: Apollo 11. 1969 December 3 - . Increasing space scientist dissatisfaction with the space program - . Nation: USA. Related Persons: von Braun. Program: Apollo. MSFC Director Wernher von Braun forwarded to MSC Director Robert R. Gilruth an analysis of increasing space scientists' dissatisfaction with the space program. "Ultimate origin" of dissatisfaction was in "the very complex and difficult interfaces between science, engineering, and management" in NASA and governmental systems and "the need for a quick and flexible challenge-and-response capability." Young scientists from an academic environment found changing from a research scientist to a science administrator difficult; they often preferred active research to desk-and-meetings career. Many scientists were reluctant to accept the long times between conceptual design and data gathering in space experiments - often 6 to 10 years. The question was not only of patience, graduate student support, and funding continuity, but also of scientific obsolescence. Scientists felt that science was not as well represented in upper NASA management as were engineering and project management and that high-level decisions were often made without consideration of scientific viewpoints. While recognizing that the space program also had other prime objectives - such as advancement of technology, national achievement, applications, earth resources, and "bringing the world closer together" - they felt that "science is still a stepchild in this family of program objectives." The analysis said that a good portion of the problems could be relieved by actions taken by Centers and NASA Hq. over the next few months and years. NASA space projects should be structured to give more scientists an opportunity to launch experiments. With the few present scientific flights, only a few scientists could hope to have their experiments flown in their lifetimes. The situation would improve when the Space Shuttle and Space Station were available, but that would not be before 1978 or 1979. With low emphasis on OAO, HEAO, Pioneer, ATM, and planetary flights suggested by the President's Space Task Group, "we will have almost no good flight experiments prepared, and almost no scientists left in the program, by the time the gates of the shuttle and the station open for science." NASA should also find ways to reduce the time span between conception and flight of an experiment. "For Bill Kraushaar, who proposed a measurement of gamma rays with a simple (now almost obsolete) sensor on a Saturn launch vehicle, this time is now 8 years, with no end in sight." For the Apollo telescope mount principal investigators, "this time will be 8 years, provided that ATM-A is launched early in 1972." The Shuttle promised great improvements, but "initiation or continuation of unmanned, relatively unsophisticated spacecraft projects for science payloads" was "highly desirable." Procedures for proposal, screening, selection, acceptance, and final approval of experiments were "exceedingly cumbersome and time consuming." Streamlining requirements after approval - early definition, documentation, reporting, reviews, and administrative actions - as well as the maze of committees, boards, panels, and offices, was urgently recommended. "Many scientists inside and outside NASA have suggested that NASA should establish, at a high level in the Administrator's Office, a 'Chief Scientist' position with no other functions than to act as a spokesman for . . . scientists who wish to participate in the space program." 1970 March 13 - . Wernher von Braun made NASA Deputy Associate Administrator for Planning - . Nation: USA. Related Persons: Rees, von Braun. Program: Apollo. Wernher von Braun was sworn in as NASA Deputy Associate Administrator for Planning. He left MSFC on March 1 and was succeeded as MSFC Director by Eberhard F. M. Rees..
Wernher Von Braun retires from NASA. - . Nation: USA. Related Persons: von Braun. He realized he had been sidelined at NASA and that future plans for lunar and Mars exploration were not to be. He became the vice-present of Fairchild Industries in Germantown, Maryland. There he was also active in establishing and promoting the National Space Institute. 1976 December 31 - . Wernher Von Braun retires from Fairchild. - . Nation: USA. Related Persons: von Braun. He had been diagnosed with cancer. Surgery was unsuccessful in halting its progress..
1977 June 15 - . Wernher von Braun dies in Alexandria, Virginia, of cancer. - . Nation: USA. Related Persons: von Braun. 1977 June 16 - . Death of Wernher von Braun - . Nation: Germany, USA. Related Persons: von Braun. German-American chief designer, leader of the 'Rocket Team'; developed the V-2, Redstone, Jupiter, and the Saturn rockets that took US to the moon. He made the idea of space travel popular in the 1950's and a reality in the 1960's..